Edward Winiarskich - A righteous Gentile, received a letter of recognition from Yad Vashem as "righteous person". He can hardly read the letter through his cataract-smitten eyes. Edward Winiarskich saved the lives of his next door neighbor and her three daughters (Hertz family) by hiding them in his cellar. 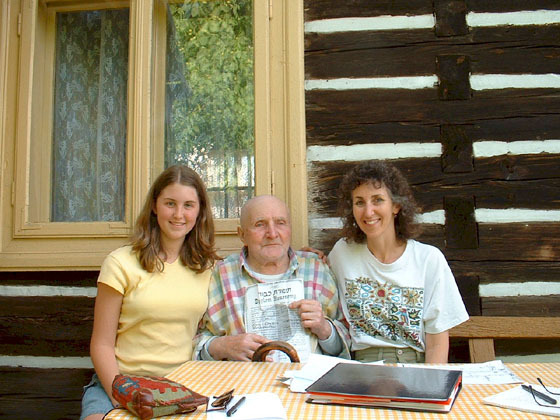 Edward Winiarskich holding the document from Yad Vashem declaring him a "Righteous Gentile", outside his home in Grêbów with Judi Garfinkel and her daughter Ariel . Click on the pictures for a full size version. However, these are large pictures. They may take a while to load. To read about this Righteous Gentile go to J. Larry Brown's Travelogue: Family Roots in Polish Towns.